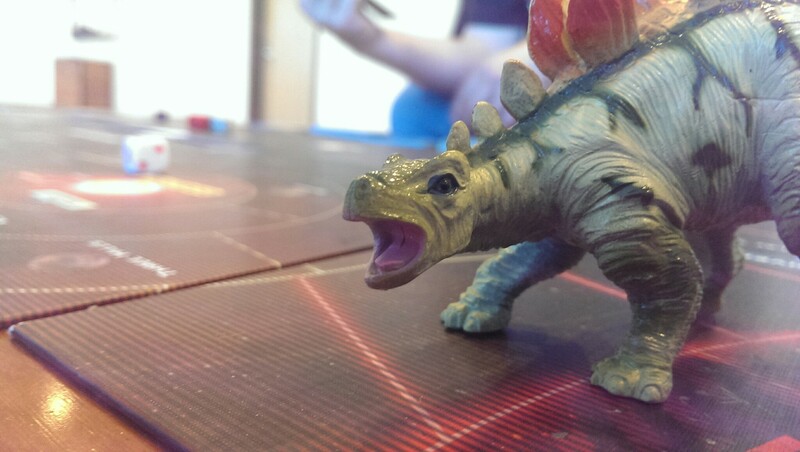 Cornok the Firefly Dinosaur welcomes you to Gen Con! 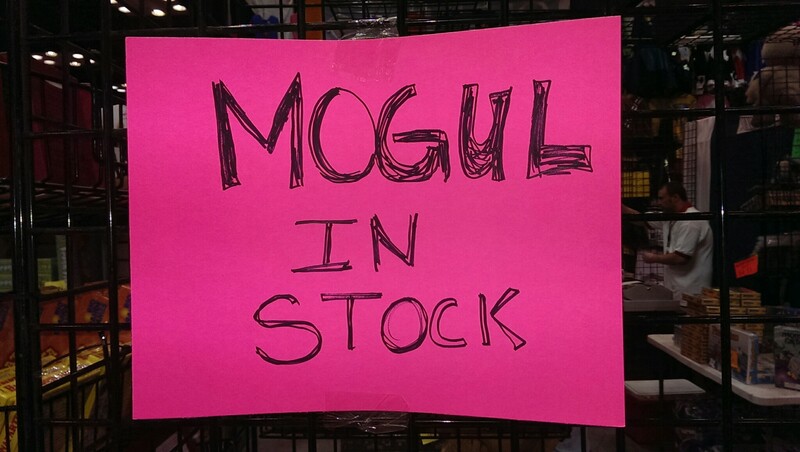 There’s a funny thing about Gen Con. It’s such a big show that two people can go and have completely different experiences. Do you love to sign up for events and tournaments? Do you play RPGs or board games? Do you set foot in the video game room? From brand new gamers to people who have been coming for twenty years, the gamer world runs the gamut of age and experience. And we all love to share our experiences. So here’s mine, and I hope you enjoy. I’ve attended Gen Con since 2010 (I have the novelty dice to prove it!) but this was my first four-day spree. I was a bit nervous, since I’m usually pretty tired after just two days. Saturday is often the toughest day, since it is so packed to the brim with people, people, everywhere. I’m not much for crowds. But there’s something a bit energizing about being around a bunch of people who share your hobby, and I’m glad I did the four day thing. More than anything, it allowed us to kick back and enjoy the time we were there. There was never a real rush to get from one place to the next. We demoed a ton of games, and we also took the time to just enjoy playing games with friends. 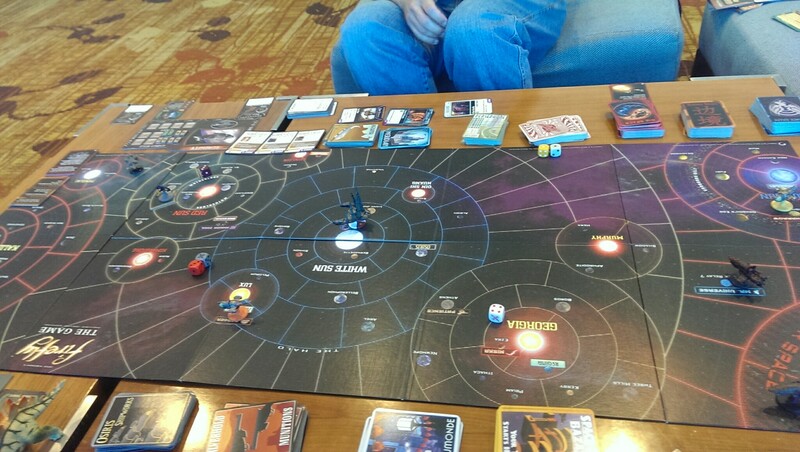 We spent the entire afternoon on Saturday playing Firefly. Sunday was a short day – we just went in to grab the last bit of loot. But it was well worth it – I highly recommend the four day run, and I will do my best to repeat it in the future. 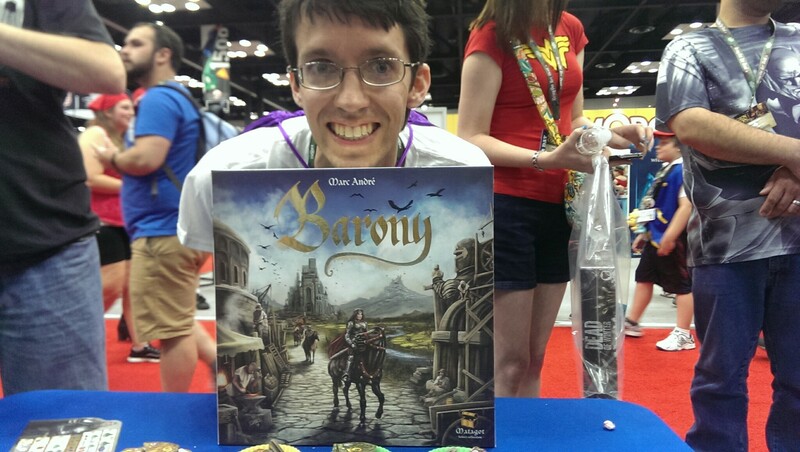 In any case, attending Gen Con did what it always seems to do – re-invigorates my excitement for tabletop gaming. We’re a tiny little site here, so it always feels a bit thrilling when we get invited to… well, to anything. I don’t know about everyone else, but I feel like a mouse among giants when I attend them, seeing all sorts of recognizable faces – Tom Vasel, those Shut Up & Sit Down guys, W. Eric Martin from BoardGameGeek. Andrew got to attend the Asmodee event last year, but this was my first time I got to go with “Press” on my badge. Blake (you know, that other Under the Table guy). We enjoyed trying out all the new Asmodee games that’ll be releasing at Essen, and seeing some from a distance. I’m going to hit some of those up with game preview articles next week, but there’s plenty of cool here. Time Stories is exciting, guys. It’s really cool. Panic Doctor takes the real-time hectic genre to a new level. Kemet (which looks pretty cool, I’ve never actually played it) and Abyss get new expansions, and more Ticket to Ride is coming. If often seems that the greater quantity of Gen Con announcements seem to be Kickstarter related (And the majority of those, especially those not tied to established publishers, seem to be mediocre), and the quality leaves something to be desired. But take heart, friends; Asmodee and its partners aren’t pulling punches. Awesome, fun punches. To the face. 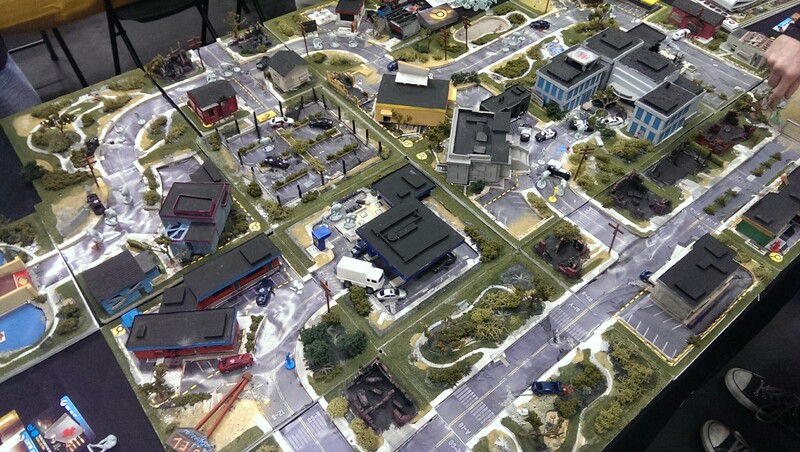 There was no Z-Man event but I did sit down with a media rep to talk about… Pandemic Legacy, mostly. Arriving at Essen, so I am counting down the days. It’s a big box with 12 scenarios, one per month (which you may end up playing twice if you lose the first game), and that’s just season 1. Season 2 is coming. If you like Pandemic, get excited. I’m excited. Iello seems like it gets bigger every year. This year was their first media event, and they presented a lot of cool stuff, which I’m going to dedicate an entire post to next week. But hey, you should know that King of Tokyo is getting a digital edition. A thousand more announcements are coming. Gaming is what the con is all about, so of course we took every opportunity to play what we could. Spyfall was pretty popular. Race for the Galaxy is great with 5 players, and we had a blast trying to roll our dice cups as loudly as we could. It took a couple hours to find a big enough table to set up Firefly, but eventually we found a space, and that took up our Saturday afternoon. We had a lot of fun with the newest expansion which extends the ridiculously long board even further, and a new scenario that urged you to get ‘solid’ with as many contacts as you could before a certain number of jobs was completed. I enjoyed the game even more this time around than the first time I played, probably both because I knew the game better, and because we had fewer players. Too many drags the game down. Six is too many. I played Rattle Battle and Flick ’em Up with @BoardGameQuest and his minions, which marks the first time I actually met up with a twitter person I wanted to meet up with. (Unfortunately, I failed several other meetups, which is par for the course, really). Making new friends is good; I just tend to make them one at a time. Also: Star Wars X-Wing. I made good on my promise to bring it and play it this year, and I was VERY excited to get my hands on the K-Wing. 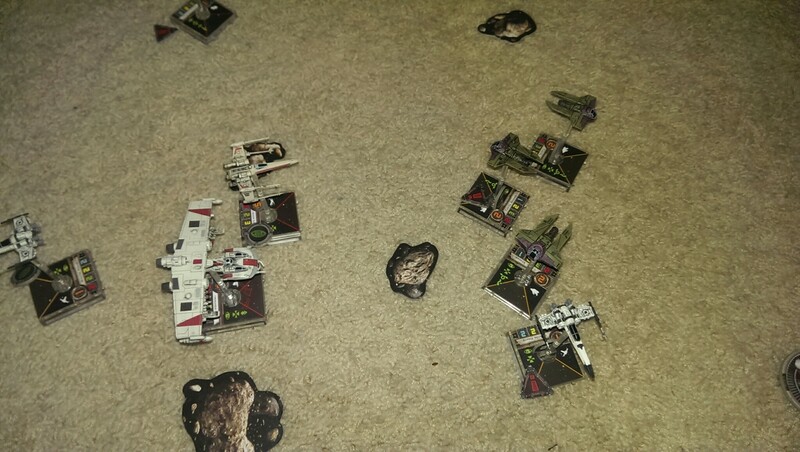 Rebel bombers! Finally! SLAMMING! Extra munitions! The world is a beautiful place… in space. Whose Con Is It Anyways? I discovered a great new coffee place this year, thanks to @UpliftAndrew, and that helped my energy level. I played Spyfall with Eric P, Roll for the Galaxy with Andrew and Nolan, Firefly with other Eric. And of course more Spyfall. We played Five Year Mission, digital Ticket to Ride, and Codenames. In short, games games games were everywhere. Oh, and how about that Math Trade? We’re getting better at it. I didn’t actually trade anything this year thanks to my own laziness, but the stuff I muled for Lenny was quick and easy, and done before the official start time. If you go next year, check out the math trade – it’s a fantastic way to turn your old gaming loot into something new for yourself. And your old stuff itself becomes new stuff for someone else. Everyone wins. 60,000 people and more attended this year, meaning there were 60,000+ completely unique con experiences. Next year, make one of your own. And tweet at me beforehand, get my phone number, and schedule a meetup. I’ll be there, I promise. Bring your favorite game. 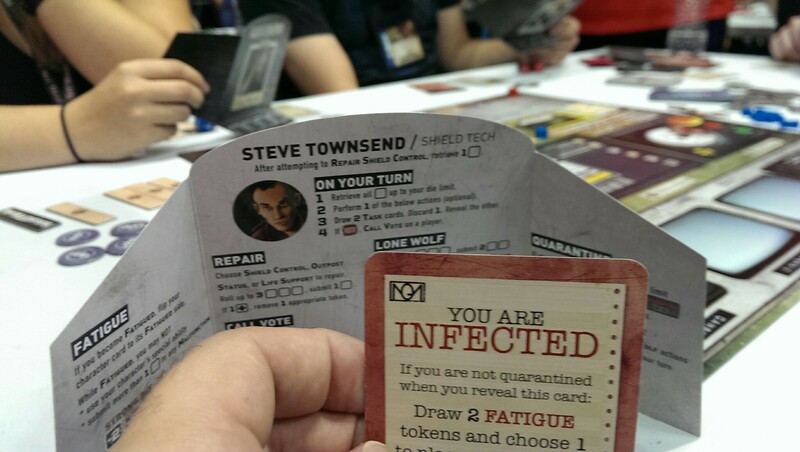 And prepare to be infected… by the Gen Con bug.